Casual music fans would be forgiven for thinking that Fleetwood Mac is the band’s first album. It isn’t even the first self-titled album in the band’s discography–that honor goes to a 1968 release put out when the band was a blues-rock trio led by Peter Green–but it might as well serve as a starting point for what Fleetwood Mac would eventually become. While it is often overshadowed by the iconic Rumours, much of what made that album great is laid out here, from the band’s smooth, folk-rock sound and the identity that Lindsey Buckingham and Stevie Nicks brought to the band. If this re-issue demonstrates anything, it shows that this album is very much deserving of the instant-classic status that its successor also enjoys. Fleetwood Mac is an album of three distinct personalities and styles that mesh surprisingly well together in a beautiful way. Buckingham provides most of the album’s rocking moments, but his slick, polished West Coast rock is far removed from anything the band did with either Peter Green or Bob Welch at the helm. Everything seems to have arrived fully-formed: the shimmering harmonies and scorned-lover lyrical perspectives are all there on “Monday Morning” and “Blue Letter,” the latter of which is one of the real hidden gems on this album. Nicks arrived in the band with a mix of heart-on-sleeve sincerity and sultry mysticism that created two of the album’s most enduring hits (“Landslide” and “Rhiannon,” respectively), and the new mastering on this edition makes her irreplaceable voice all the more powerful. The extra material available here only serves to underline just how remarkable the album is. Demos on box sets like these usually show a slow progress as each song develops from its barest beginnings to the finished product. That’s not quite the case with the demos for Fleetwood Mac, nearly all of which are mostly finished songs that lack the final production touches of the album versions. The early versions of Buckingham’s songs here mostly just lack the vocal harmonies that gave the final versions that extra kick, while McVie’s early recording of “Over My Head” is essentially finished. Given the amount of overhaul in the band at this time, the unified front presented in these studio outtakes is surprising indeed. The real conflict in Fleetwood Mac circa 1975 comes out in the live material listed here. Yes, Buckingham and Nicks were brought in with the purpose of shaking up the band’s sound, but Fleetwood Mac had spent a decade as a wonky blues band before then, and those habits are difficult to break. Live, the band seem to be in a constant tug of war between their hard-rocking past and their poppy present. It should be a mess, but it instead gives the band a fire and energy that one doesn’t get on the recordings. The band’s newer material has a sharper edge, best exemplified by Buckingham’s blistering guitar work on the live version of “Rhiannon.” Similarly, the renditions of early blues material gets a new life by being interpreted by musicians less attached to the traditions of the material, turning them into fiery rock songs with just the right amount of aggression. It’s a wonderfully jarring experience for anyone who thinks of this era of Fleetwood Mac as a baggy-clothed folk-pop band without any harsh edges. Whether they rocked or not, this iteration of Fleetwood Mac endured because of their songs. For all that can be said about Peter Green or Bob Welch during their respective time with the band, it’s clear now that the band’s focus was more on performance than on songwriting when they were figureheads. Buckingham and Nicks changed that entirely, and along with Christine McVie, they put pop songwriting at the forefront of what the band was about. The end result was a run of some of the greatest, most enduring pop music of all time and it all began with Fleetwood Mac. The original Fleetwood Mac was a British blues band, which operated between 1967 and 1974 when Mick Fleetwood, John McVie and his new wife, keyboardist Christine, found themselves without a lead vocalist and lead guitarist, and scouting LA for replacements. Cue Lindsay Buckingham, who insisted his singer and partner Stevie Nicks were conditions of his joining Fleetwood Mac. Musically this also drew a line in the sand to their role as blues campaigners. So, 40 years on we're celebrating what was the new-look Fleetwood Mac's self-titled album, second only to the mega selling Rumours, reaching over 40 million in sales, and securing a top 10 position in overall album sales. This special edition version of Fleetwood Mac contains favourites like Oh Daddy, Say you love me, Rhiannon, Landslide and Over my Head. Better still the CD/LP that accompanies the original album catches early versions of some of the songs, as well as live versions. In other words, it's a treasure trove of a band that's on its way to super-stardom. While, with sales of just 40 million, it's overshadowed by Rumours, Fleetwood Mac is one of those releases that sounds as fresh today as it did in 1975, and with then bonus album it's pretty much essential for any record collection. Some tacos are destined to change the world. Take the ones over which the remnants of Fleetwood Mac ‘auditioned’ Lindsey Buckingham and Stevie Nicks in a Mexican restaurant in LA in 1974. Mac were smarting from five years of slumping record sales and the departure of guitarist and songwriter Bob Welch; Buckingham and Nicks, who had a flop album themselves with 1973’s Buckingham Nicks, were on the verge of quitting their part-time LA jobs, ending their floundering relationship and going their separate ways. The Mac needed only a new guitarist, but Buckingham refused to join unless they took Nicks as well. Mick Fleetwood gave his remaining core songwriter, Christine McVie, a veto over Nicks, but the pair got on famously. By the time the margaritas were drained, softrock history was shaken on. The Mac album (the band’s tenth) that this fresh new line-up began recording just three weeks later – with Buckingham so pushy in teaching the veteran rhythm section their parts that John McVie chided him: “The band you’re in is Fleetwood Mac. I’m the Mac. I play the bass” – would become their second self-titled release, to mark their final transition from Peter Green’s blues-rock version to a new country-rooted pop-rock sound. The title heralded a new Fleetwood Mac, and their second era would become one of the most successful rebirths in rock. Inevitably, one returns to 1975’s Fleetwood Mac with radar attuned to the first whispers of Rumours, and there are plenty circulating within these semi-magical 42 minutes. The simmering emotional friction that gave the 40-million-selling 1977 follow-up its invigorated snarl is absent, but the building blocks are stacked high. Buckingham sets out his stall from the off, with the country rock rattle of Monday Morning acting as a practice run at Second Hand News and a minor hint of the unsettled bitterness to come. ‘Got to get some peace in my mind,’ he whines, little knowing he was at least one monster international hit album away from any such thing. Later he plays the invigorated Nashville cowboy rocker with aplomb on Blue Letter and World Turning – an early attempt at electrifying spit’n’sawdust C&W in the vein of The Chain – but at this stage, as he lilts a little blandly over ponderous album closer I’m So Afraid and a reworked version of Crystal from Buckingham Nicks, he feels something of a bit-player in the new Mac order. It’s Nicks who lands with the impact of a superhero from space. Rhiannon’s sly-eyed dance of the seven veils was the first stone-cold classic of Mac 2.0, instigating the strain of guttural gypsy queen allure that would give this new incarnation its sliver of exoticism, and her other major contribution, future live staple Landslide, set a benchmark for Fleetwood Mac’s folk balladry that they would, somewhat miraculously, go on to top. Here, Nicks is slumped disheartened in an Aspen sitting room, gazing out at the Rocky Mountains, considering giving up everything to go back to school and wondering how her life had become such emotional scree. The autobiographical honesty of the track would seep into the bedrock of Rumours. Elsewhere, Christine McVie was demonstrably coming into her own. Languid, mildly jazzy tracks such as Warm Ways and Over My Head perhaps throw back too heavily to the Bob Welch era or even Albatross, albeit with Buckingham’s country licks hovering overhead, but with the wonderfully upbeat Say You Love Me and Sugar Daddy she dovetailed perfectly with Nicks and Buckingham’s brand of honeyed hippie honky-tonk. 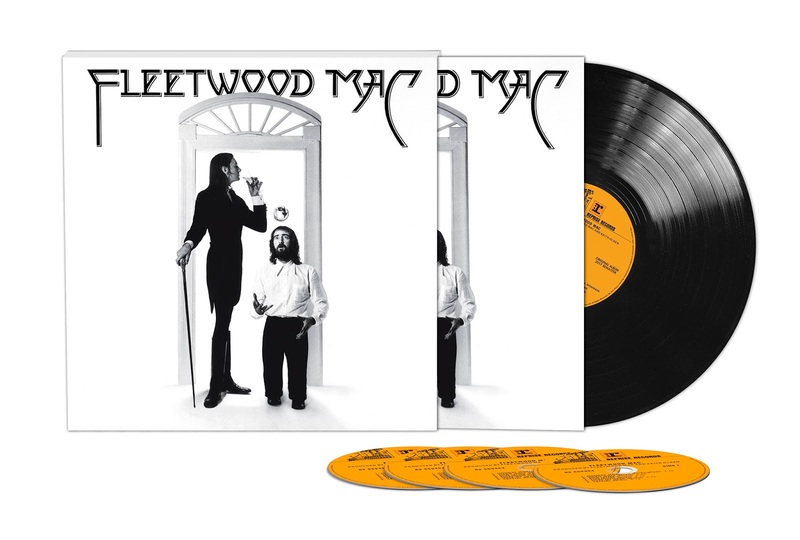 Of the live tracks, instrumentals and studio out-takes making up the additional 35 tracks of the deluxe package, it’s the unpolished, formative early takes of the original album’s tracks that will most fascinate the dedicated Mac-heads – this was, after all, where Fleetwood Mac’s most celebrated incarnation clicked or clashed. Here, the urgent quiver to Buckingham’s ragged rough takes of Monday Morning and Blue Letter smack of a desperate young songwriter grasping his last chance hard. In contrast, Nicks’ sultry assurance has her adding to the ghostly charms of Rhiannon with an opening speech: “Sometimes you wake up and Rhiannon’s right there.” When the in-band soap opera kicked off in earnest, exaggerating these very traits in Nicks and Buckingham, the world would love to love them both; for now, Fleetwood Mac was the sound of a blessed second chance gradually realising just how blessed it was. Thanks for compiling several reviews! Great fun to read!